Of course, watching tutorial after tutorial and scrolling through look after look can be time-consuming, so in the spirit of all things double, double, toil and trouble, we played detective and did the investigative work for you. If you're like us, you'll only have a day or two before the big night to pull something together anyway. (FYI—these clutch, non-cheesy makeup kits will totally help in an hour of need.) Thus, to make your fire burn and cauldron bubble this Halloween, keep scrolling for nine witch-inspired makeup looks sure to spellbind every soul (or soulless) character you encounter. For a true Wicked Witch of the West vibe, we suggest channeling this epic makeup moment from Mayra Isabel this coming Halloween. Emerald glitter-encrusted lids accented by a bold, blood red lip take the look up a notch. Keeping with the screen theme, we're into this rather horrifying yet 100% enchanting witch makeup tutorial from SmashinBeauty. After all, it doesn't get much more sinister than a metallic black pout. 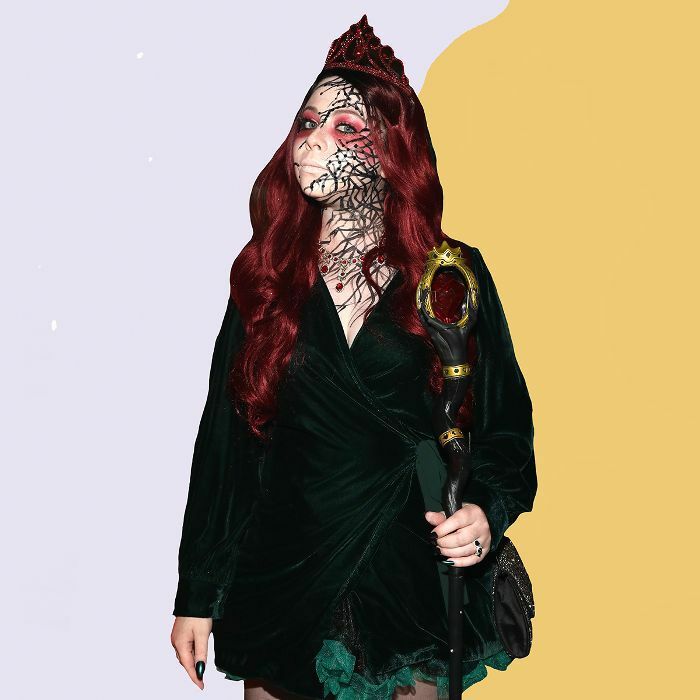 If you like the idea of channeling your inner Elphaba but don't want to commit to a full face of green (we get it), this slightly subtler look courtesy fo Madeyewlook Twice might be more your cup of brew this Halloween. It's accented with small doses of lime and a little bit of strategic shimmer. If you're the type of witch who loves her contour, look no further. We're entranced by vlogger Katherine Elizabeth's transformation process and love the versatility of the end result. Vampire? Witch? Skeleton? A Twilight-inspired hybrid of all the above? We'll let you pick your poison. Alright, this impeccably scary witch tutorial from StickerOkie isn't for the faint of heart. But, if you have the intention to truly give the gift of fright (or dare we say legitimate terror) this Halloween, her Evil Witch makeup is the ultimate antidote. Just make sure you won't encounter any young children, okay? Looking for something that's more trick-or-treater friendly? We're super into this celestially sculpted witch makeup from YouTube vlogger atleeeey. It's scary but still hauntingly beautiful. Disney lovers, prepare yourselves. Despite the fact Disney princesses often overtake our costume-studded feeds Halloween night, we're partial to the idea of going against the grain and working an ill-destined Disney witch instead. To get you inspired, this makeup how-to from Shonagh Scott is probably the most captivating we've seen (and that's a very bold statement). While most witches we witness Halloween night are characterized by their signature black strands, dark makeup, and perhaps greenish tinge, we love the idea of a platinum-blonde witch to counter. With bold brows, platinum waves, milky skin, and sky-high lashes, this look from Jordan Hanz feels a bit Old Hollywood, no? Alas, a purple-pursed pout and bloodshot eyes lend some much-needed spooky edge.